Tuesday's storms and heavy rain sent water gushing down the stairs and escalator at the Cleveland Park Metro station — and a D.C. Water spokesman said a nearby parking lot expansion might be part of the cause. 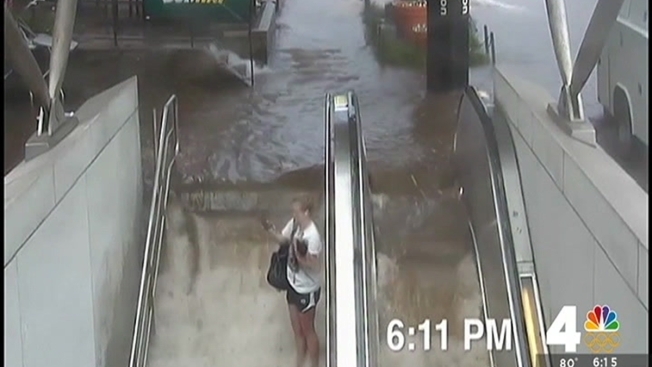 New video from Metro shows just how much water was pouring down into that station as rain rushed over the steps and escalator at Cleveland Park, creating an unwanted waterfall. "Most people are a bit stunned and surprised" about the flooding," said Metro rider Josh Stanton, who also shot a video of it. He said some people started to panic when it didn't stop. "It was a flash flood in the truest sense of the word," he said. "It was just rushing in. In about a span of 30 seconds, it went from that one side of the Metro to about a foot deep throughout the entire place." However, the flooding is not a new issue, said John Lisle, chief of external affairs for D.C. Water. The agency had a meeting three years ago with the office of D.C. Councilmember Mary Cheh and other agencies about the problem. The problem apparently began when a nearby parking lot was expanded and a grassy area was paved over, according to part of an assessment done at the time, Lisle said. In the process, part of the drainage system was "eliminated without adequate replacement," the assessment said, according to Lisle. "The entrance to the Metro Station is located between the parking lot and catch basins in the street so during rain events water flows overland from the parking lot into the station before reaching storm drains," the assessment said. The team concluded that the drainage issue needed to be addressed at the parking lot, but Lisle said he didn't know if it was ever done. However, the responsibility lies not with D.C. Water, but with the property owners or possibly the D.C. Department of Transportation, Lisle said. D.C. Water visited Wednesday to check their drains outside the station to make sure nothing was caught in them. "These right here these are catch basins — which you can see there's no water and no debris — they are clean," said Eric Kelly of D.C. Water. "It was just too much water too fast and the swerve line couldn't take it." D.C. Water crews were on site Tuesday night, though, clearing the drains as well. People in the flood-prone neighborhood wonder if something more can be done to stop all the flooding. "If we have more than 15 minutes of rain, we will have geysers in the 3700 block of Connecticut Avenue, where the water has no place to go but up," said resident Mark Strattner. In this case, all the water was sent down the steps and escalator. Metro spokesman Dan Stessel said the transit agency hasn't seen flooding like this at the station in recent memory.